Your website’s homepage is arguably the most important page of your entire site. Users need to quickly understand what you have to offer and how to find any further information they require. At the same time, your homepage is often the first impression your users will experience, therefore design is as equally important. It can be a difficult balance but we’ve put together some good examples for you. Zenzes is a company that designs, produces and distributes jewelry. Their homepage has a clear brand focus with a big background image and a link to their newest collection in focus. It is a beautiful and simple homepage where the image carries the whole design. BUT note that it is not strong when it comes to SEO since the page lacks content for the search engines to find. Alternatively you can place text in the bottom of the page, e.g. an introduction to the company, that visitors have to scroll down to find. In that way you won't ruin the profound first impression you get when entering the site. 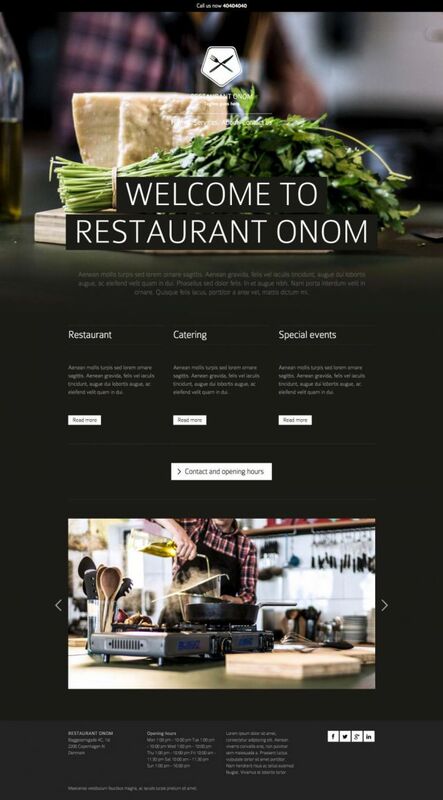 In this example with a restaurant homepage you will also find that they are using a dark background image to cover the top of the page. The menu and the logo have been elegantly centered in the top and below you find an introductory text to the concept. Below the text there are three teasers for central pages on the site and furthest down you find a gallery showing photos from the kitchen. In the footer you can find opening hours etc. Overall, this is a homepage that gives you a good impression of the restaurant it represents. 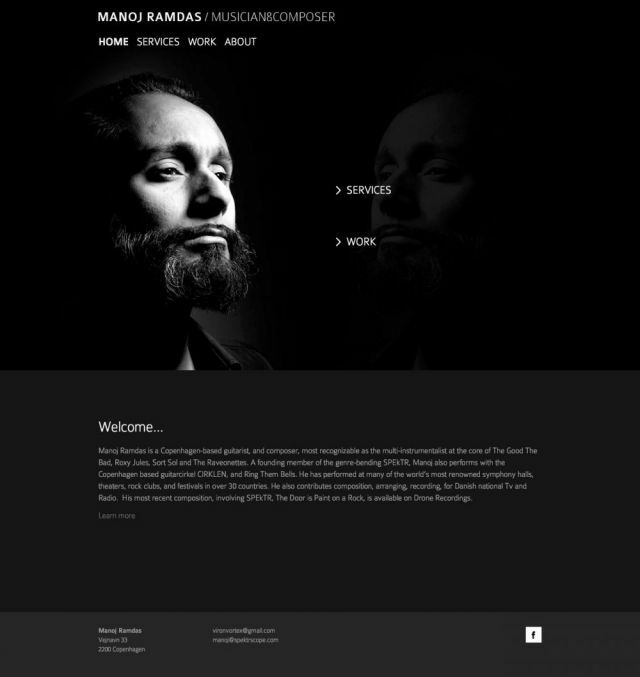 This website is an example of a site focused on the person behind the musician and composer Manoj Ramdas. On the front page you see a picture of Manoj and two links to what the site is all about: what he's doing and his prior projects. In the bottom you find a short description of his story. The boutique twentyninetwenty is a reseller of designer clothing for individuals. The homepage is kept in a simple, feminine style with a top image and an introduction that quickly gives you a good sense of the store. Below the introduction you find teasers for the two main areas on the website, cothing and shoes for adults and children. As the design suggests, it is mainly for women and girls. On the bottom of the page you find a gallery with some example items that can be bought from the boutique. Goodpeople has chosen a distinct graphical top image on their homepage with a short and expressive text that communicates what they do very concisely. Just below, they have placed an introduction video where they talk about the company and their services. Further down the page you'll find testimonials from customers talking about the fantastic work Goodpeople has done for them. At the bottom of the page there are some examples of Goodpeople's productions. This is a good example of what a homepage for a hair salon could look like. The menu is centered across a big background image, where a distinct display text is placed on top. Below the text you find two links, one for booking an appointment and another that links to a page describing the services. Furthest down there is a short introduction to the salon.